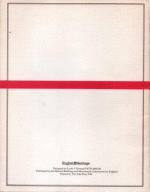 Edition Details: Facsimile Reprint of the eighth edn. Softcover. Facsimile Reprint for English Heritage. 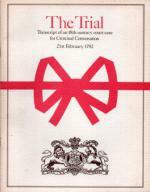 The Trial, with the Whole of the Evidence, between the Right Hon. Sir Richard Worsley, Bart. and George Maurice Bissett, Esq. 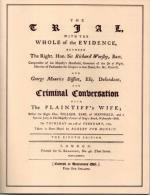 Defendant, for Criminal Conversation with The Plaintiff's Wife; Before the Right Hon. William, Earl of Mansfield, an d a Special Jury, in His Majesty's Court of King's-Bench, Westminster Hall, on Thursday the 21st of February 1782. Taken in Short Hand by Robert Pye Donkin. The Eighth Edition. Printed for G. Kearsley. 21pp. 4to. softcover. Designed by Leslie V. Howard. V. sl. sunned card covers, o/w Nr. F. with no creasing to covers.